The main entrance of London's St Paul’s Cathedral became the front line in a so-called war against capitalism. Anti-capitalist demonstrators set up a tented city in front of its steps . St Paul's initially welcomed the demonstrators and the Canon Chancellor said he supported the right to peaceful protest and asked the police to leave. The cause appeared to be dear to their Christian hearts, and the Dean said there was something profound about a gathering of those concerned about poverty facing the great dome of this cathedral church. The clerics were are also said to be deeply concerned that, in backing legal moves to evict the protesters, the cathedral will be condoning violence. But would there be any violence if the protestors did not resist lawful and reasonable instructions to move on? Did these clerics really think that because they are protesting about poverty they should be regarded as above the law? The resignation of several clerics led demonstrators to believe that they can bring about the collapse of a cathedral if not capitalism. This demonstration is the latest copycat of tented protests in cities around the world, now calling itself the ‘Occupy’ movement. The London protest, ostensibly against the Stock Exchange, follows the New York, Anti-capitalist, demonstrations against Wall Street. The movement models itself on the ‘Arab Spring’ protest in Cairo’s Tahrir Square, in which the Egyptian masses courageously took on a tyrannical regime. But, while the "Arab Spring" protesters were calling for the kind of freedom comes under Western capitalism, our demonstrators are fighting the very system that gives them the freedom and safety to protest. The placards at St Paul’s declaring that global commerce is ‘our global Mubarak’, ‘our global Assad’ and ‘our global Gaddafi’ stupid, sick and opportunistic, but the whole ‘Occupy’ protests is totally incoherent. 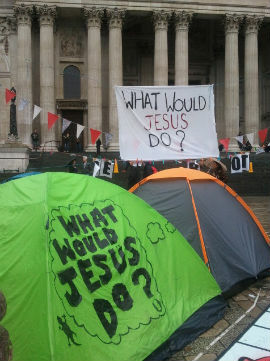 The demonstrators call themselves ‘Occupy the London Stock Exchange’, yet they are camped out in front of a cathedral. It is not clear what the protests are against because their causes multiplied to include the eviction of the Dale Farm travellers, Climate Change and NHS reforms. 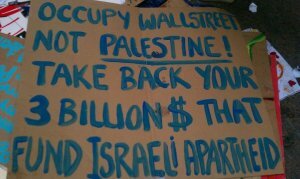 Indeed, among the placards on Wall Street and in London were serious signs of anti-Semitism. The principal target was the bankers, even though much of the fault for the financial crisis lay in a failure of regulation — but ‘hold Whitehall to account’ doesn’t have the same revolutionary appeal as ‘bankers are evil’. This self-indulgent exercise is certainly not a spontaneous protest by ordinary people. It is just one more tent city in the worldwide fashion, organised by those on the Far Left, who believe that capitalism is in its death throes and only needs of a kick in the gut to finish it off. Strangely, public reaction to this encampment has been largely sympathetic because people support any protests against bankers and rich people — and the demonstrations by-pass the established political process with which they are disillusioned. This is an outcome of a dumbed down news media that values emotion over reason, leading people to mistake exterior show for substance and accept protesters ostensibly campaigning against greed and to alleviate poverty, without exercising normal healthy scepticism. People have reacted to emotional instead of making true moral judgements and holding the right people to account for their behaviour. This has given rise to ugly scapegoating of bankers and the wealthy (and of Jews and Israel) — with precious little difference between this hatred and what extremist agitators have been declaring for decades. These ‘Occupy’ protests are symptoms of the erosion of democratic legitimacy and the steady disintegration of moral authority giving rise to fractured social order, windows smashed by anti-globalisation protesters and torched city neighbourhoods of Britain. We are witnessing the rise of mob rule by the spoiled children of the very society they are so determined to destroy. 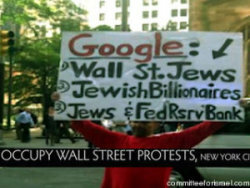 The protesters are purportedly against western capitalism and hold it responsible for all the ills of the world. Does Dr Williams agree with this fatuous position? One wonders why these church leaders appear eager to accept the role of villain of capitalism along with the evil bankers. The church is paralysed by its own doctrine that poverty is noble. It therefore instinctively hates those who make money. Now a proper concern and compassion for the poor is indeed noble but to fetishise poverty to the extent that the church cannot recognise hypocrisy and anti-social behaviour is deeply troubling. It substitutes sentimentality for the distinction between right and wrong. Do these people really care what Jesus would do or are they humanists, communists, secularists or atheists who want to use Christian jargon to put a guilt trip on the church to drag it behind their secular protest? Is the church losing moral authority by following socialists doctrines instead of preaching the Kingdom of God and allowing changed lives to change the world? Rather than sympathising with those who are inciting hatred for bankers, the church should be reaching out in Christian love to bankers and other sinners and leading them to repentance and the forgiveness of Jesus. The church should be leading with moral clarity instead of being lead by left wing agitators! We should have Christ's agenda; not the “progressive” agenda of the media and the humanists, evolutionists etc. How can the church allow itself to get involved in scapegoating instead of taking Jesus' message of repentance and forgiveness to sinners, including bankers? Quite easily, if the lessons of the run up to the Holocaust have not been learned. 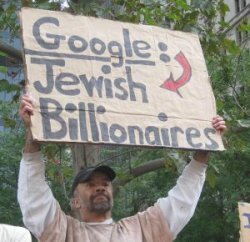 There are aspects of these protests that have echoes of the Nazi era when Jews (particularly Jewish bankers) were made scapegoats for the economic plight of Germany. London - What does this mean if not a dig at the Jews and Israel? 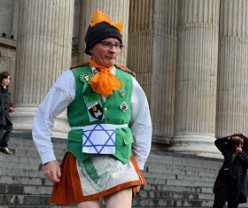 This guy, apparently, has some connection to the Republic of Ireland. These protesters paint themselves as radicals but they are actually the “progressive” herd. Christians who go along with them are actually being sheep rather than true radicals like Dietrich Bonhoeffer and Martin Niemöller– the few who went against the tide. "What should we do then?" the crowd asked. John answered, "The man with two tunics should share with him who has none, and the one who has food should do the same." Tax collectors also came to be baptized. "Teacher," they asked, "what should we do?" "Don't collect any more than you are required to," he told them. Then some soldiers asked him, "And what should we do?" He replied, "Don't extort money and don't accuse people falsely--be content with your pay." He has sent me to proclaim freedom for the prisoners and recovery of sight for the blind, to release the oppressed, to proclaim the year of the Lord's favor." When Jesus heard this, he said to him, "You still lack one thing. Sell everything you have and give to the poor, and you will have treasure in heaven. Then come, follow me." When he heard this, he became very sad, because he was a man of great wealth. Jesus looked at him and said, "How hard it is for the rich to enter the kingdom of God! Someone in the crowd said to him, "Teacher, tell my brother to divide the inheritance with me." Jesus replied, "Man, who appointed me a judge or an arbiter between you?" Then he said to them, "Watch out! Be on your guard against all kinds of greed; a man's life does not consist in the abundance of his possessions." Now there were some present at that time who told Jesus about the Galileans whose blood Pilate had mixed with their sacrifices. Jesus answered, "Do you think that these Galileans were worse sinners than all the other Galileans because they suffered this way? I tell you, no! But unless you repent, you too will all perish. Jesus might also have mentioned the tenth commandment about not coveting. Might it not have been better if the church, like Jesus, had confronted these demonstrators with their own sin and their need for repentance? – That would have been radical. How about a really radical mission? - to the rich, in their great need of salvation? The church makes itself look ridiculous when it follows behind the world's agenda and then tries to join the front of the parade.